On the other side of the Fjord from Preikestolen is another breathtaking cliff, Kjerag. 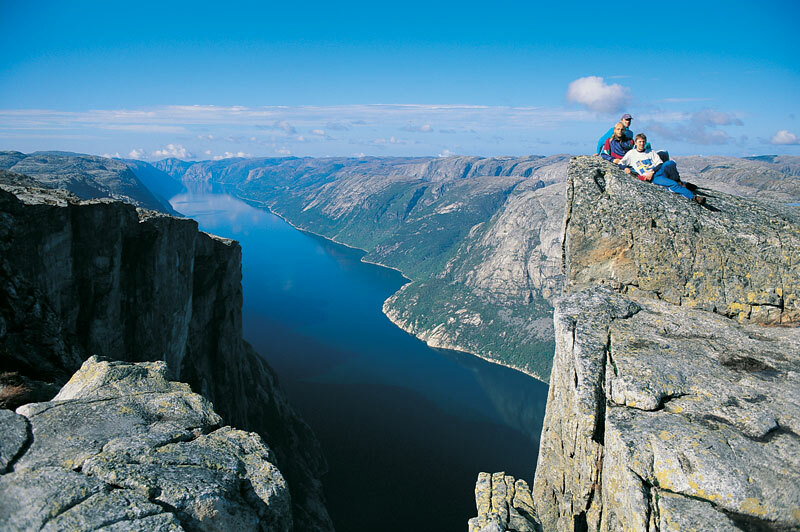 Its highest point is 1110 m above sea level, but it is the northern drop to Lysefjorden that attracts most visitors. The drop to the fjord is a stunning 984m (3,228 ft). Kjerag is a popular hiking and climbing destination and many go there because Preikestolen has become a bit crowded. 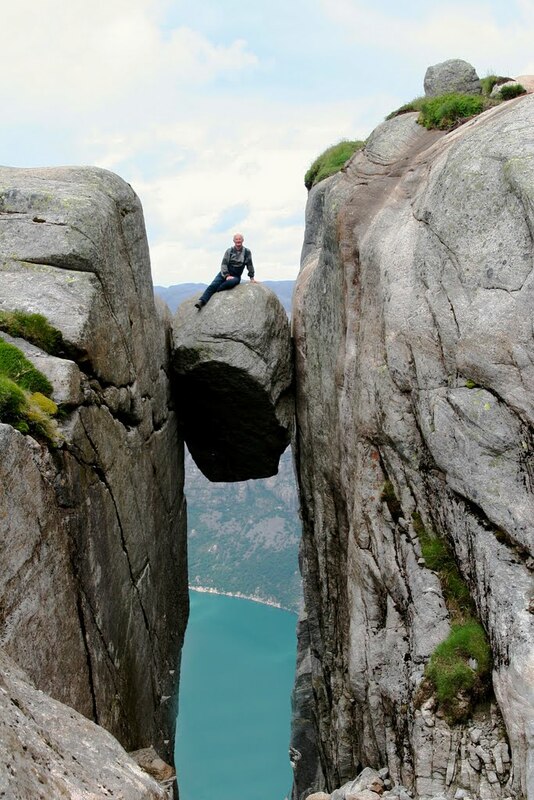 Kjerag is also popular among BASE jumpers around the world but they won’t add to the crowd too much as most of them jump off the high cliffs as soon as they get there. Wedged in a crevace of Kjerac there is also a famous boulder called Kjeragbolten. 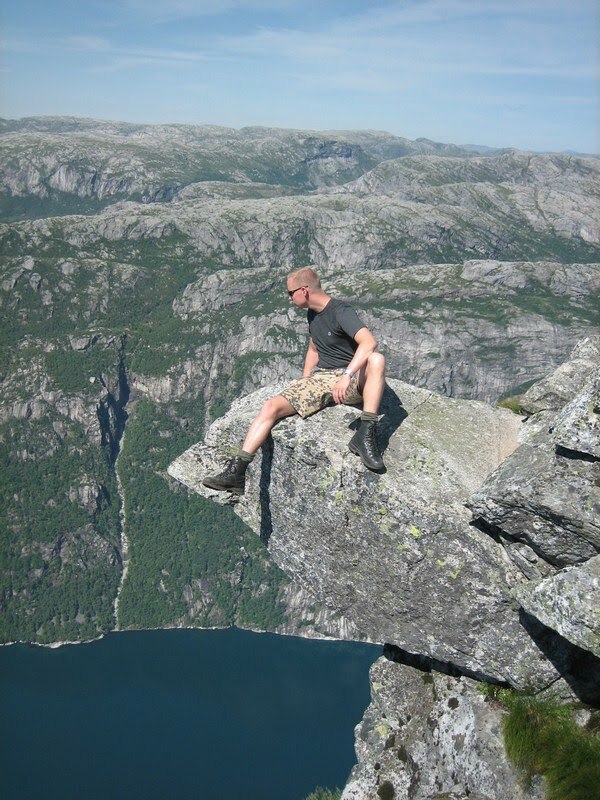 It is possible to jump onto the rock without any equipment, but remember there is a direct 241 m drop below and then another 735m gradient down to Lysefjorden. The hike to Kjerag is more demanding than the one to Preikestolen. The terrain is not the easiest kind and the hike is mostly recommended to adult, experienced hikers. The marked trail begins at Øygardstøl and takes 4-6 hours back and forth. Øygardstøl can be reached by own car along the mountain road and the parking at Øygardstøl is free. Alternatively, you can take an organized tour from Stavanger to reach Øygardstøl. There is also a regular bus from Stavanger to Øygardstøl. The bus leaves from the Fiskepirteminal in Stavanger at 7:30 am and from Sandnes bus station at 7:50 am. The hiking and parking are free. If you are taking a tour bus from Stavanger to Øygardstø, the price is around 490NOK for adult and 390NOK for child.